“Disruptive Physician” is one of the most misused terms in healthcare these days. 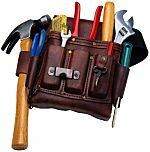 How to communicate your legitimate concerns up the chain of command and NOT GET LABELED "DISRUPTIVE"
In many organizations, those two words have become the c-suite’s trump card to quash any physician resistance to new administrative programs. These programs are often have purely financial motives or are a brazen attempt to dump additional tasks on the physicians with no regard for their workload or stress levels. The doctor’s legitimate concerns about quality of care don’t matter. They are lost in the politics of the silos of the administrative and clinical sides of the organization. They are quickly seen as not being a “team player”. 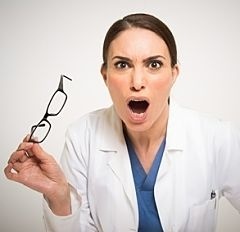 The “disruptive physician” label comes flying out and the doctor is deftly tossed under the bus so the meeting can move on to the next topic. This abusive labeling is bullying, plain and simple and it has significant, long term negative consequences. It is the quickest way for the administration to destroy trust on the clinical side of the business. It often creates permanent consequences for the physician, including diversion into any number of “treatment programs” and not uncommonly losing their job. 1) Disruptive physician labeling is incredibly common … as survey results from our physician community attest. 2) Everyone loses when this happens; the administration, the physicians and the patients. These simple steps show you how to communicate like an administrator. They allow you to you raise your concern in a way that you will be heard and avoid the dreaded disruptive physician label. In a recent survey of our HappyMD community, 41% of doctors had been labeled disruptive physician at least once and 25% more than once. Administration bullying of physicians and the inappropriate use of disruptive physician label are common topics on physician websites generating long strings of “me too” comments. The rapid changes in the healthcare system in the US are driving much more frequent clashes between clinical quality and basic business principles. Most organizations are not set up to honor the input of the physicians. Disruptive physician labeling is accelerating. When an administrator gets their way with the disruptive physician bully tactic, it is the most effective way to destroy trust on the entire clinical side of the business. Sure, their administrative colleagues may cheer them “keeping the doctors in line”. They have won what they perceive as a battle and are preparing the ground to lose the war. It is important to keep in mind who performs the cash flow generating activities in a healthcare business. No doctors, no dollars. Unhappy and betrayed doctors behave in multiple ways that cripple the organization. It is equally important administrators understand the doctors don’t consider this to be just a business. To physicians medicine is a calling, an art and a science and an honor we have dedicated our lives to. When we are called out as a disruptive physician for raising a legitimate clinical concern to an administrator who has never seen patients … is a world class insult. This is the shortest path any administrator can take to a toxic culture in the workplace. You will pay in physician and staff turnover. If administration wants to know why innovation is so slow to be adopted in the organization, they only need to look in the mirror. The negative effects will roll down to the staff and the level of care quality and patient satisfaction … guaranteed. If there is an organization in the same town that values the input of their physicians and gives them equal power in the decision making committees of the organization … a place where the physicians know that administration “has my back” … this organization will outperform the dysfunctional organization hands down in all areas. The disruptive physician label is often a consequence of a monumental clash between a the communication style of a physician and that of an administrator. We are highly trained experts at finding a unifying diagnosis … the crux of the problem … the thing that is likely to go wrong. We see clinical issues administrators are completely unaware of. We do all of this at lightening speed, because in our diagnoses often must be made quickly. When we see a problem, we point it out without hesitation and we are not used to having to explain ourselves. And we shoot from the hip – see it and call it, without regard to the social setting or the politically correct thing to say in the given situation. One word for this is “blurting”. This is not how you make your point to an administrator. They do not think or communicate in this fashion. In many cases the reason for disruptive physician labeling is this clash of communication styles. If the first time you raise a clinical concern with a proposed workplace “innovation” is by blurting it out in a meeting — using a declarative statement with little emotion attached — you are well on the way to gaining your first disruptive physician label and probably don’t see it coming. To raise a concern for the first time in the midst of a meeting is the definition of rude to an administrator. Discovery and building of consensus is best done before the meeting occurs – much like the work in politics is done in conversations before they vote on the bill on the floor. You want your concern to be discussed, shared, understood and at least a partial consensus on what to do about it … all done BEFORE any committee meeting. Ask questions of everyone involved in the proposal and everyone who will be part of the decision on whether or not it goes forward. This guarantees an open ended question that will draw the maximum of information from the person to whom you are speaking. 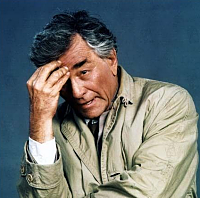 I understand Columbo’s style goes against your doctor programming to be “seldom wrong and never in doubt”. Please do your best to let that go. Columbo was never called disruptive and was always very effective. In your pre-meeting discussions, if you find your concern is shared by your colleagues, build consensus (before the meeting) on several solutions or ideas to address your concerns. You will have consensus on the concern and the possible solutions in your back pocket before the meeting begins. Always keep the team focused on the highest possible corporate value – one that everyone can agree to. Usually this will be quality of care or patient satisfaction. This is your trump card. When you are bringing up any clinical concern about an administration proposal, relate it to one of these higher values whenever you can. It can sound like this. This phrase used early and often keeps everyone focused on the big picture, and not your objection. It states something no one can disagree with and keeps them from immediately disagreeing with you. If you feel this decision is flawed and inevitable, suggest a limited pilot project with before and after metrics to make sure your concern did not occur. Do not raise your concern the way you would normally do on automatic pilot … as a declarative statement of fact. Let people know what you are feeling with a civil tongue … just make sure you have done the work before the meeting so that everyone is aware of your concerns and feelings. Do not leave a paper trail or voice mail trail. It is completely appropriate to be seriously paranoid about documentation of any of your concerns in a format that could be shared. Your concerns are best relayed exclusively in conversations. Do not send emails, text messages, messages through your EMR or leave voice mails ESPECIALLY if you are upset and venting to someone you feel is a trusted colleague. If you must vent in an email, write it and then delete it. Do not create a paper or voice mail trail. If you do leave recorded or written evidence of your concerns, you are running an almost 100% risk of those documents or voice mails falling into the hands of someone who will label you as the next disruptive physician on staff. Here’s why. Make sure you raise your concerns in conversations, where the other person can understand your energy, tone, body language and caring for everyone involved – especially the patients. There is no way any of that can be understood through a text, email or voice message, especially by an administrator who does not agree with or understand your position. Ultimately, if you work in an organization with a pattern of hostility towards the physicians and clinical staff and a habit of bullying with the disruptive physician label … you will decide whether that is something you will tolerate or not. You always have the option to vote with your feet. - Have you ever been labeled a disruptive physician? - If you are in a leadership position, what communication tools do you use to avoid the disruptive physician label ? - If you have tried channeling Columbo, how did that go for you?